The best speakers with the best playlists. Bose, specialists in manufacturing award-winning audio equipment, asked Hydric to build a Spotify playlist generator into their suite of SoundTouch apps. This generator would allow users to quickly create and queue playlists for immediate playback on their SoundTouch speaker systems. Having already gained familiarity with Bose, our team was able to use existing system knowledge to our advantage. This was especially vital to the seamless integration of the new playlist generator feature into the pre-existing mobile and desktop applications, and allowed us to focus on creating intuitive features that added value to the user experience. 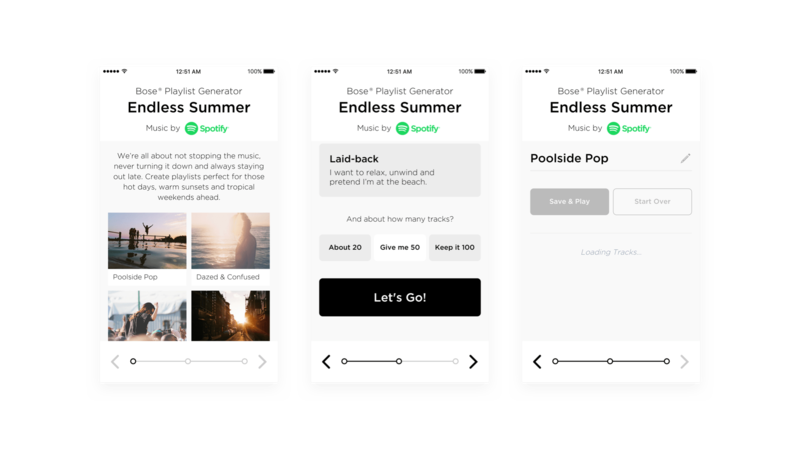 The biggest consideration during the design and development process was how to integrate the playlist generator without disrupting existing user interactions. 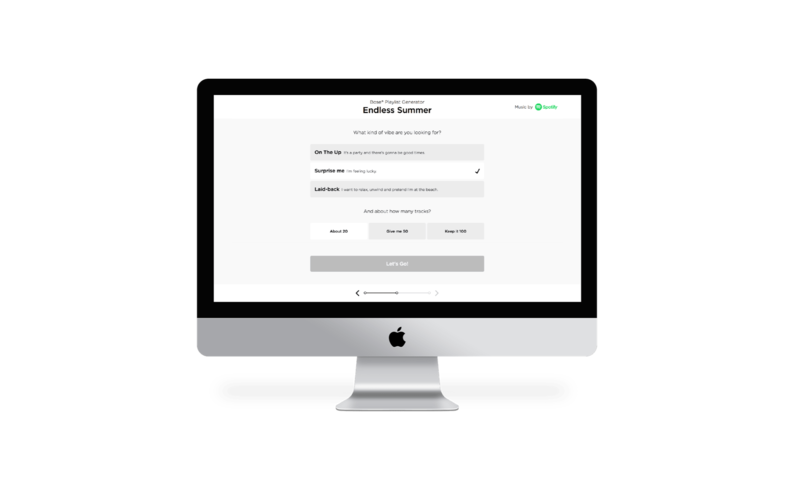 To this end, we worked closely with Bose’s internal digital team in order to gain an in-depth understanding of their customer’s behavior on the existing application. This allowed us to make appropriate decisions that were tailored to popular user flows, complementing them rather than detracting from them. Powering the playlist generator required Hydric to tap into Spotify’s API. This was necessary for two reasons. First, it allowed Hydric to leverage the Spotify Recommendations API to generate playlists for the users based on their desired genre, mood and duration. Secondly, it allowed the user to listen to their newly created Spotify playlist on their SoundTouch speakers and save it to their Spotify account. Themed playlist options were created, with up to six playlists available within each theme. The themes changed throughout the year dependent on seasons and events, mapping to specific playlist seeds that generated the most appropriate tracks for the theme. Pre-populated and newly-generated playlists could then be saved as presets on newly-purchased SoundTouch speakers. The Bose Playlist Generator was released mid-2016 as an update to the SoundTouch Speaker apps for iOS, Android, PC and Mac. The team at Bose has since taken over maintenance and support post-release.